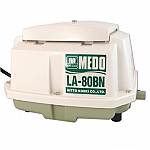 Medo Linear Piston Air Pumps are a great solution for a home aerobic sewage treatment systems. Medo linear piston pumps have a single internal piston reducing operating noise and vibration while increasing durabilty and long life. Unit Weight 11.7 lbs. 11.7 lbs. 20.7 lbs. 20.7 lbs. 12.6 lbs. Dimensions and weights are for reference only. Pumps brands and models are registered trademarks of Medo USA, Inc.